For those who find the US–India relationship complex and at times down right confusing the resolution is simple. There are actually five US–India relationships: the government to government relationship; the military to military relationship; the global integration between Bangalore and Silicon Valley; the link between Indian students and American universities; and the ties between the Indian–American diaspora and India. Of these the first two, which are still influenced by Cold War thinking and suspicions, have faced the most stumbling blocks. The last three, which are the products of globalisation and flourish because of the phenomenon, are the most promising and productive. Residual Cold War suspicions and political mindsets haven’t allowed the governmental and military relationships to reach their full potential. On the one hand, the 2006 US–India nuclear agreement has made India both a de jure and a de facto nuclear power. Further, the Obama administration has publicly supported the Indian demand to be made a permanent member of the UN Security Council. At the governmental level, however, Indian concerns about Washington’s support of Pakistan (although much less than in past decades) continue to put limits on the relationship, as does a hangover with maintaining India’s policy of nonalignment. 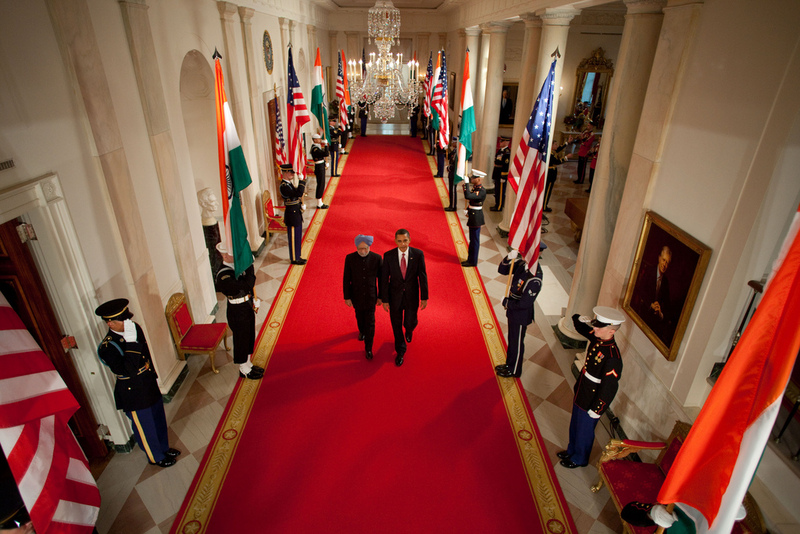 In Washington, India’s independent stand on issues leads policymakers to question the value of the new relationship. Domestic politics have also complicated the relationship as Indian coalition governments have been forced to consider the anti-American sentiments of some of the parties in their coalition. The military relationship has made significant strides since the early 2000s, when India still faced sanctions for its 1998 nuclear tests. Joint military exercises have increased the respect of both militaries for each other and India is slowly starting to move away from its dependence on Soviet era weaponry to modern western—particularly American—systems. Thus India is to become the second largest operator of C-17s in the world and is buying maritime patrol aircraft and possibly attack and transport helicopters from the United States. In terms of helping the United States project power in Asia such systems would be of greater value than fighter planes but the US government placed great hope on India buying either the F-16 Fighting Falcon or the F/A-18 Super Hornet. In fact, when India, in what some regard as an odd choice, picked the French Rafale medium multirole combat aircraft, it led the American ambassador in New Delhi to hand in his resignation. The major sticking points in the military relationship remain Indian concerns about becoming overly dependent on US weapons systems and then facing crippling sanctions in the event of a crisis. Further, the strategic worldviews of both countries are not fully congruent since India is unwilling to be too closely associated with American policy toward the region. While the military and political relationships have their limitations, the relationship between Bangalore and Silicon Valley has flourished because of the opportunities provided by globalisation. In the short span of a decade, the growth of Indian Information Technology has led to fruitful collaborations with American knowledge-based corporations that have flocked to Bangalore and set up shop there. As the officials in Cisco’s Bangalore office point out, if you take a ten hour flight radius from either of Cisco’s global headquarters—San Jose and Bangalore—you cover about 70% of the world. With Indian software corporations continually moving up the value chain, these linkages will only grow as increasingly specialised services are provided to American clients. Similarly, the link between Indian students and American universities continues to grow, with over 103,000 students currently enrolled in American colleges . The long-term effects of increased Indian student enrollments in the United States are multi-fold. Students with advanced degrees will bring a new set of skills and technological outlooks to the corporations and governments that they work for, whether in India or abroad. The trends have changed, however, in the last 10 years; in the past Indian students tended to not return to India. Now, however, an increasing number are coming back with their new scientific and entrepreneurial skills to set up their own companies. Either way, it is a win-win situation for both nations, as the flow of global intellectual labour has positive long-term consequences. Indian students who stay on in the United States will contribute to America’s leadership of the global knowledge economy and, given their ties to India, are likely to maintain business links with firms within India or elsewhere, or outsource some of their own company’s work to India. Such Indian–American companies are also intuitively much better at understanding the Indian corporate world and consumer market and, therefore, are able to function effectively within it. The last piece of this puzzle is the Indian–American diaspora and its connections with India. With a median income of $90,717, the Indian American community is prosperous, well educated, and now increasingly politically active. Such activity ranges from the success of politicians like Bobby Jindal and Nikki Haley to the effort of Indian-American diaspora groups to pass pro-India legislation in Congress—the most notable example being the diaspora’s lobbying efforts on behalf of the India–US nuclear deal. The US–India relationship, therefore, has room for considerable growth thanks to the forces of globalisation and it would be in the interests of the Indian and American governments to expand these aspects of the relationship rather than gauge the success of the partnership in purely military-strategic and political terms. Amit Gupta is an Associate Professor in the Department of International Security Studies at the USAF Air War College, Maxwell AFB, Alabama. The views expressed in this piece are his own and do not necessarily reflect those of the US Department of Defense or the United States Air Force. Image courtesy of Flickr user The White House .